Extraordinist Craig Karges is known to millions of television viewers for his remarkable demonstrations of extraordinary phenomena on The Tonight Show with Jay Leno, Larry King Live, and many other TV shows. He presented his one-man touring show "Experience the Extraordinary" at performing arts centers, universities and corporate events in over 150 cities worldwide in 1998. Karges also delves deeper into the power of the subconscious disclosing how to use dreams to solve problems and gain powerful insights about life. He reveals how it may be possible to know the unknown - how to exploit your natural psychic abilities. Readers will learn how to recognize these powers, develop them, and use them in daily life. Karges includes exercises, games, and stunts that help readers test and enhance subconscious skills, while amazing their friends at the same time. the highest adventure on Earth. Your brain weighs about three pounds and it looks like a soft, wrinkled walnut. Pretty unimpressive looking at first glance. However, it has been in the making for about five million years. Whether you consider what it does or how it is constructed it is, by far, the most extraordinary organ in your body! The human brain can store more information than all the libraries in the world! It is the cause of that violent outburst that you were so embarrassed about as well as the force behind the best idea you ever had and the most charitable action you ever took. Your brain regulates all bodily functions and is responsible for your most primitive behavior as well as your most sophisticated accomplishments. All of your thoughts and emotions, indeed your personality, is inside that three-pound organ. You can receive a heart or lung transplant and still be yourself but if you were able to receive a brain transplant, you would no longer be you! Scientists have studied the brain for hundreds of years yet it remains so mysterious that many consider it humankind's ultimate frontier. Your brain is a biological organ but it is also like an amazing machine, a supercomputer. It is miraculous! Your brain is truly one of the most amazing things in the universe. Think of it this waythe human brain is the only object capable of contemplating itself! We, as human beings, tend to sell ourselves short. We stand in awe of computers, yet inside each of our brains lies ten times the amount of AT&T's entire communication networking system! We marvel at other animals like dolphin or ants. We can sit and watch an ant colony and be fascinated by it. How do they create such a complex structure? How do they communicate? An ant has about five hundred brain cells. That's the amount a person loses from drinking one glass of wine! But don't worry, we each have about 100 billion brain cellsthat's as many as there are stars in the sky. Each brain cell, or neuron, connects with all the others. Imagine, 100 billion electrical connections going on inside your head right now! Think of it this way: Imagine everyone in the world (about 5.5 billion people) talking on the phone to each other at the same time. That's a complicated image, isn't it? But to get an idea of the complexity of what is happening inside your head, you have to expand on this image. Take those same 5.5 billion people, put them on eighteen telephones each, have them all talking to each other at the same time and, if you can picture that, you can begin to understand the complexity of the communication process inside your brain! If each neuron could only touch two other neurons, the number of possible configurations in your brain would be two to the 100-billionth power! That number would take you about nine hundred years to write out at one second per digit! In reality, because each neuron connects with all the others, the possible configurations are impossible to understand. These busy little neurons send, receive and store signals that add up to information. Everything we do and all we know depends on the transfer of signals from neuron to neuron. A neuron has one big tentacle, its axon, and many smaller ones, its dendrites. The axon sends the signals which are received by the dendrites of other neurons. This is an electrochemical process that occurs at a point between cells called a synapse. This is as technical as we are going to get (aren't you happy!). But let me give you an extraordinary fact about dendrites, the receiving tentacles of the neuron. Believe it or not, we have over 100,000 miles of dendrites in our brains! In other words, the total length of dendrites in your brain could encircle the Earthfour times! You might think that as we develop as human beings, the amount of connections among the neurons in our brains would increase. However, it appears that the opposite is true. There may be more connections in an infant than in a fully developed adult. Development seems to be about refining certain connections and not about making new ones. Think about this: In the first weeks of life, a baby's babbling includes almost every sound of every known language! However, infants lose their ability to make sounds that aren't in the language they are learning to speak. The point is that the brain has enormous potential to do many things, such as learn the thousands of languages in existence, but we may only learn one or a few. What human beings are capable of is astounding; what we accomplish is often disappointing. Enriched: One of the brothers was placed in a large cage with other rats. This group was given new toys to play with daily, as well as food, water, etc. Standard: One brother was placed with two other rats in a small cage with food and water. Impoverished: One brother rat lived by itself with food and water. The experiment concluded that the rats in the enriched environment had an actual increase in the weight of their brain! Ten percent was average. And, what about the idea that we only use 10 percent of our brain? This figure and similar ones have been thrown around for years. I have been guilty of doing it myself during my entertainment and speaking engagements. Some people argue that only 10 percent of the brain has been mapped. We know that huge sections of the brain can be damaged and we can still function normally and we know that damage to certain small areas of the brain can be disastrous. Perhaps all of our brain is used at some point. We don't really know. What we do know is that we are far from knowing the limits of the mind's capabilities and our full potential. Compare your brain to your computer. Most of us only use a small percentage of our computer's power; it is the same with our personal computer power, our mind power. In many respects, the brain is like a supercomputer. Scientists have spent more than a decade trying to develop a computerized version of the brain called a neural network. But these neural networks are very primitive when compared to the human brain. For example, while the human brain contains 100 billion neurons, its electronic counterparts typically contain the equivalent of a few thousand neurons (called neurals), or less. Each neuron in the brain has at least forty-six different attributes, such as the ability to interpret what you see or what you hear. The average electronic neural has about five attributes. Robert Hecht-Nielson of HNC, Inc. (a neural network firm in San Diego) says creating a brain-like computer is hundreds of years away. He likens the creation of this theoretical computer to the difficulty of developing spaceships that fly faster than the speed of light. The entire notion of creating computers with artificial intelligence (A.I.) has been steadily losing ground. In the 1970s and 1980s, scientists specializing in A.I. were confident that they would someday replicate human intelligence by creating a computer that could learn and reason. Marvin Minsky was one of those scientists, a pioneer in A.I. In 1970 Minsky felt that within three to eight years a computer with the intelligence of an average human would be a reality. Thirty years later, no one has even come close to creating a machine that thinks like a human. What about the chess-master-defeating IBM super- computer, Deep Blue? As you probably recall, Deep Blue defeated grand-master Garry Kasparov, and this fact hurt some human egos. But let's put this in perspective. Deep Blue is still just a machine. Do we really think any less of humans because we can't run as fast as a car? Because we can't fly like an airplane? Because we can't add as fast as a calculator? Perhaps some human egos were bruised by the defeat of Kasparov because while many people can accept being surpassed by machines in mechanical tasks, they believe chess to be a creative as well as a mathematical endeavor. Deep Blue is a two-million dollar, 1.4-ton supercomputer with thirty-two microprocessors and 512 support chips that was not designed to reason or learn, but rather to do one thingcrunch numbers. By doing that, it could come up with strong chess moves because the human brains of Deep Blue's programmers successfully reduced chess to a mathematical game. Let's take a look at how you can use more of your extraordinary brain! What would you say if I told you that when you finished reading this chapter (and applying what you've read), you will learn to think like a genius? Accelerated learning experts have developed techniques based on the idea that you can become more creative and productive by using your whole brain. What do I mean by this? Our brain has two hemispheres, the right and the left. They share our thinking and the control of our body. The left half of the brain controls the right side of the body and the right half of the brain controls the left side. Each hemisphere seems to specialize in certain functions. The left brain's specialties are spoken and written language, logic, number skills and scientific concepts. Work that might primarily involve the left brain are bookkeeping, laboratory jobs and the like. The right brain excels in recognizing patterns and shapes and how they relate to one another. It also seems to contribute most to insight and imagination. It is the hemisphere that appreciates art and understands humor. The work of a musician or architect draws heavily on the right hemisphere. We need to strive to balance these two hemispheres. Creativity consultants say that left-brain dominants can learn to use their right brains by forcing themselves to daydream, draw and become more open and aware of their surroundings. If you feel you are a right-brain dominant, you can tap into your left brain by forcing yourself to take notes, ask detailed questions, make concrete plans and organize things through the creation of systems. At first, you may be uncomfortable when consciously shifting to using more of either hemisphere. But after a while, it will be second nature, and your brain will be balanced! Here's another technique to master more of your brain power when it comes to reading information. In this day and age of information overload, we are often swamped with things we need to read and process. One of the best methods for retaining information is to range read. This is how it works: You first get an overview of the book by reading the table of contents and chapter headings, before you actually begin reading the book. By doing this, you implant the book's main ideas in your mind, paying special attention to those that interest you the most. This way you don't spend excess time reading the sections that don't pertain to you. While I would love for you to read this entire book cover to cover, feel free to practice range reading with it as it covers a wide variety of topics. Jump start your brain by practicing brainstorming. Write down your problem or goal and then just quickly think of solutions. Write them down as quickly as they come to mind. The key is not to censor yourself. Write down the wildest, most absurd ideas. When you're finished, play with your ideas, placing them into categories or putting diverse concepts together. The results can surprise you. When brainstorming, one of the most productive techniques is called mind mapping. It's a process of taking notes that mirrors the brain's thinking process. Instead of taking linear notes (outlining, for example) which are controlled by the left brain, mind mapping uses colored pens which stimulate the right brain. Draw a central picture in the middle of the page. Shooting out from the picture are smaller images and single words with connecting lines drawn from one idea to the next. The principle is that free association encourages new ideas and unlimited thinking, while traditional note-taking stifles people. Any time you're taxing your brain, you should take hourly brain breaks instead of working until you drop. These five or ten minute breaks will help you stay mentally alert. These breaks can be used to stimulate different parts of your brain by doing activities like listening to classical music or taking a walk. Speaking of walks, please don't overlook the aspect of physical exercise when trying to boost your brain power. Your brain is a hungry and demanding thing! It only makes up 2 percent of your body weight, but consumes 20 percent of your total oxygen and glucose stores. Your brain operates best when nutrient-delivering channels, like arteries, are kept clear. This is exactly what happens when you exercise. Typically, the more fit you are, the faster your brain fires synapses responsible for quick thinking. Studies suggest that the brains of frequent exercisers process visual information more rapidly than the brains of more sedentary people. Some quick brain-enhancing tips: Any activity that gets your heart beating faster will nourish your brain; learn a new physical skill that requires quick reflexes; or do something to throw your brain off. But don't get stuck in a routine of doing the same things day in and day out. So far we have been discussing the brain in a very physical way. But what of the mind? The concept of mind is more intangible. We know that we have one, but where does it reside? Most experts at least connect the brain and mind, and many believe that they are one and the same. However the whole idea of the mind and consciousness is a fascinating mystery that we are going to take a quick look at in the remainder of this chapter. What is consciousness? It seems obvious, but it is perhaps the most baffling phenomenon associated with the human brain. At the turn of the twentieth century, Sigmund Freud transformed the study of psychology into a modern science. In doing so, he proposed the first comprehensive theory of the human mind. Freud believed that the mind consisted of two parts: the conscious and the unconscious. He believed the unconscious, shapes behavior and is the repository of an individual's experience. Yet, Freud believed the ideas and drives of the unconscious could only be examined through creative outlets like dreams, fantasies or artwork. A stable, collective unconscious made up of images, common to all humans, which influence and shape our lives. Jung developed a fascinating theory called synchronicity which draws on the unconscious. Synchronicity pertains to oddly coincidental things popping up during a brief period of time. For example, you're discussing a movie you saw with a friend, you turn on the TV and the movie is showing. You then receive a phone call from the person with whom you saw the film. Jung felt that many of these coincidences may be engineered by forces at work on a personal and collective unconscious level. William Kautz, an expert on intuition, looks at the mind as having three concentric circles: the inner core of our consciousness is surrounded by a larger circle of personal unconscious which, in turn, is encircled by the superconscious which Kautz refers to as "the reservoir of all human knowledge and experience, actual and potential." We will look at Jung's collective unconscious as well as Kautz's superconscious mind later in the book. 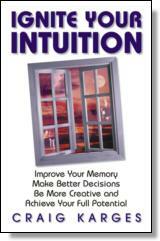 Much of the remainder of this chapter, indeed, much of this book focuses on your extraordinary unconscious mind. However, before we get into the unconscious, I want to introduce you to some exercises designed to enhance your senses and therefore expand your conscious mind. These exercises will also help you better understand the nature of this book. You are not just reading a book. You are taking part in an interactive experience! You are holding on to a workbook (hopefully you will think of it as a playbook) designed to truly fast forward your brain and to reach the outer limits of your mind! For you to receive maximum benefit from this book, you must try the exercises in this and the following chapters. Look at a photograph or picture for thirty seconds. Then, turn it face down so you can't see it. Next, list all of the details you can recall from the picture. Look again. Compare your notes with the actual picture. Identify what you missed and see if something comes to you about why you missed it. Note the differences. Tracking the distinctions of an object increases the reality of the object. Your unconscious notices these things all the time. By practicing this technique you become more aware of the type of information your unconscious absorbs. Listen to a recording of a song or speech. After the recording is over, use your keyboard, pen, pencil or cassette recorder, and write or record a detailed description about what you heard. Notice variations in the pattern of speech or the variations of the rhythms in the music you heard. Notice the timbre of the sounds of the music or the speech. Notice the emotion that is being communicated and how it affects your feelings. Notice if the words match the tone of voice. Detail everything that makes this recording stand out for you. Repeat the exercise, this time describing what you are hearing as you listen to the recording. Compare the two and determine which is better for you. Evaluate if you hear more with your eyes closed or open. Sound stimulation usually increases if other senses are decreased. However, your retention will be increased if more than one sense is employed. Listen to a television program, but don't watch it. Imagine the action taking place instead of using your eyes to watch. Base the action on what you hear instead of what you can see. Tape what you are watching with your eyes closed, then go back and watch it with your eyes open. Compare the two. Which was more vivid? How do they compare? When you are around others, begin focusing on the words you are hearing, not on what you are planning to say. Making active listening a part of your normal behavior will expand your conscious awareness. Find a room with no distractions and notice the silence. Notice the natural sounds that take place around you: air conditioners, cars, the wind, birds, etc. What sounds come to you when there are no artificial soundsonly silence? Assemble an assortment of different shaped and textured items, such as: stuffed animal, plastic ball, glass, steel rod, wooden pencil, aluminum foil, screw, a variety of fabrics. Blindfold yourself or just close your eyes and pick up each item and explore it with your fingers. Picture the feelings in your mind as emotions. After you have completely explored one item, remove the blindfold or open your eyes. Write or record your sensations, detail by detail. The greater the diversity of your chosen items the better your results. Shutting down your other senses results in the refinement of the particular sense you are using. It's nice to have an assistant for this one. Assemble an assortment of foods with different tastes and textures in bite-sized quantities, such as: fruits, vegetables, grains, dairy and sweetscooked and uncooked. After you are blindfolded or after you have simply closed your eyes, your assistant will place one of the food items in your mouth. Explore the taste and textures. After you have completely explored one item, remove the blindfold or open your eyes. Write or record your sensations, detail by detail. The greater the diversity of your chosen items, the better your results. Have an assistant help you with this one as well. Assemble an assortment of items, including the same kind of food items used above, plus non-food items, such as things you find in nature, and things manufactured that you don't usually associate with smell. After you are blindfolded or your eyes are closed, your assistant will place one of the items an inch from your nose. Inhale and explore your sense of smell. After you have completely explored one item, remove the blindfold or open your eyes. Write or record your sensations, detail by detail. The greater the diversity of your chosen items, the better your results. If you practice the exercises detailed above you will begin to notice things that previously would have escaped your conscious mind. The more you practice the more refined your super senses will become. However, no matter how sharp you make your senses you still can't consciously take in everything. The amount of information taken in by the brain each day is astounding. It has been estimated that the human brain makes over 100,000 operations per second and can hold 100 trillion bits of information. If our conscious minds tried to handle all of this, we would go crazy! Every second, 100 million messages from our nervous system bombard our brain. Only several hundred are permitted above our brain stem and only a few of these receive some sort of response. The human eye is capable of processing about five million bits of information per second. The human brain is capable of processing only five hundred bits of information per second. Think about those numbers and think about how much of that visual information you are aware of at any one point in time. And this is just what's coming in through one sense. You can't possibly consciously process all the information your eyes give you in one second, let alone all the information that you're given in a minute, an hour, a day, a week, a month, a year or a lifetime. In fact, it is estimated that in any given second we consciously process only sixteen of the estimated eleven million bits of information our combined senses pass to our brains. Consider the cocktail party phenomenon. You're at a crowded, noisy party carrying on a conversation, the ambient noise all around you makes no sense and sounds like a gaggle of geese. However, if you cease your conversation and focus on the conversation between two other people in another section of the room, you can actually hear their words! All the conversations in the room are coming into your brain at one level. You just aren't aware of it consciously. I was appearing in Saudi Arabia and the company hosting me had a farewell reception in my honor. It was a cocktail party (without the cocktails) and many conversations were filling the room. I was engaged in one of those conversations with a woman concerning the power of the unconscious. We tried the cocktail party phenomenon and focused on a woman and a man having a conversation across the room. They were talking negatively about the woman I had been conversing with, saying things like, "Can you believe what so and so has on tonight?" The woman was a little embarrassed but then we laughed about it. She then said, "You know I never liked that woman, but I could never figure out why. Maybe it's because she talks about me behind my back in social circles when I'm present and my unconscious picks up on it." Maybe. With so much information bombarding our brain, much of it is ignored by our conscious mind. But that doesn't mean that the information is lost. Much of it is routed to the unconscious mind. The information is there, but the conscious mind does not always have direct access to it. For example, you run into an old high school friend on the street whom you haven't seen in years. He remembers your name, but you can't recall his. You're embarrassed. You have a brief conversation and then walk away. As you are walking down the street, his name pops into your mind. This is an example of unconscious knowledge being tapped by the conscious mind. Here's another: Remember when you were taking a test in school and you read the question, but couldn't think of the answer, although you knew that you knew it? Maybe you went on to some other questions and then came back to that one and the answer was there. Or perhaps, you finished the test and as you were leaving the classroom and walking down the hall the answer came to you. Again, you had the information; it was in your brain. You just couldn't get to it when you needed to. Frustrating! Have you ever awakened just before your alarm went off? Some people do this all the time. In fact, my friend, Bob Hendrik, went for years without wearing a watch and was never late for anything. We used to work together when I toured my stage show on college campuses. One day he was given a wristwatch as a gift. He grew dependent on the watch, and his inner sense of time faded although he still retains the ability to awaken right before his alarm goes off. Your inner sense of time, your "body clock," is another part of you controlled by the unconscious mind. Think of the mind as an iceberg. The small portion of the iceberg visible above the surface represents the conscious mind. However, the bulk of the iceberg lies beneath the surface and represents the unconscious mind. Your unconscious mind is a vast warehouse of knowledge, ideas and experiences. It's like a filing cabinet filled with pictures of every person you ever met and every event that has happened to you. Obviously, if you could freely tap into this pool of unconscious knowledge you could make decisions with more insight, become more creative and be able to process new information in a much more insightful way. I believe your unconscious is really the key to tapping into your creative and intuitive capabilities. Your unconscious mind is almost like a secret genius. There was an interesting article in The New York Times entitled, "Your Unconscious Mind May Be Smarter Than You." The article focused on the work of psychologist Pawel Lewicki, who confirmed not only the existence and power of the unconscious mind but also how astonishingly smart it is. In Lewicki's experiment, volunteers were asked to push buttons corresponding to the apparently random appearance of an "X" on a computer screen. The "X" was following a very complex but deliberate pattern based on ten interconnecting rules. As an incentive, the volunteers were told that they would be given one hundred dollars if they could figure out the pattern. None could. However, as they continued the test, each subject's response time quickened as they began to intuitively choose the spot where the "X" appeared. In other words, their unconscious mind figured out the complex pattern although their conscious mind failed at the same task. It may sound unbelievable, but it's true! Your unconscious mind is not only smarter than you think, but it is smarter than you can consciously think! In this chapter, I have given you a lot of information about your brain, your mind and how they function. I want you to be in awe of your mind! I want you to be thinking, "You mean I own a Rolls-Royce, but I'm driving a Buick!?" I hope that I have already opened up your mind a bit to the fact that the mind has more possibilities than our ordinary modes of consciousness can imagine. Consequently, life has more possibilities than our daily experience allows. As life becomes more demanding, we need to explore those possibilities and it is just that exploration which awaits you in the chapters ahead! (c)1999 Craig Karges. All rights reserved. Reprinted with permission from Ignite Your Intuition by Craig Karges. No part of this publication may be reproduced, stored in a retrieval system or transmitted in any form or by any means, without the written permission of the publisher. Publisher: Health Communications, Inc., 3201 SW 15th Street, Deerfield Beach, FL 33442. Extraordinist Craig Karges is known to millions of television viewers for his entertaining demonstrations of extraordinary phenomena as seen on The Tonight Show with Jay Leno, Larry King Live, CNN Headline News, CNBC, E! Entertainment Television, Lifetime Television and The Nashville Network. Craig's interest in the mysteries of the mind can be traced back to his relationship with his great-uncle (a vaudeville-era stage medium turned spiritualist). At the age of fourteen, Craig began working with his uncle. Upon his uncle's death (one year later), the fifteen-year old Karges inherited his uncle's vast library of books and manuscripts on magic, mentalism, spiritualism, psychology and parapsychology. Delving into his uncle's extensive legacy, Karges discovered many secrets of what is now called extraordinary phenomena. Unfortunately, his great-uncle passed away before completing all of his research. This left the young Karges with many unanswered questions and many mysteries to explore. Craig has spent the last quarter of a century doing just that. Craig Karges first became popular touring college campuses. He was named "Entertainer of the Year" four times by the National Association for Campus Activities and twice by Campus Activities Today magazine. He also was named the most popular variety entertainer on the college circuit for ten consecutive years, as well as being named best male performer and best performing arts attraction. Even Karges's peers find his work fascinating. He was named the top performer in his field worldwide by the International Psychic Entertainers Association. The National Speakers Association (NSA) honored him with the Certified Speaking Professional (CSP) designation, a recognition bestowed on less than 10 percent of NSA's four thousand plus members. Craig Karges says that he does not possess supernatural powers, nor does he claim to perform as a psychic or a magician. While he acknowledges that he is an entertainer, and showmanship plays a role in what he does, he has a standing offer of $100,000, payable to charity, if anyone can prove he uses stooges or confederates in his demonstrations. Karges currently spends his time traveling the world as both an entertainer and a speaker appearing at theaters, festivals, showrooms, and performing arts centers, as well as universities and corporate events. As an entertainer, his stage show, "Experience the Extraordinary," is a fantastic blend of mystery, humor, psychology and intuition using total audience participation. Craig dazzles the mind as he challenges his audiences to question what is real and what is unreal. He explores the unexplained, the unknown and the unbelievable—all seemingly by the power of the mind. Unspoken thoughts are revealed; predictions are made and verified; matter passes through matter; objects move through the air. As one reviewer put it, "It's like The Twilight Zone live on stage. But, it's not frightening; it's fun." There is a surreal quality to his performance. You will believe it when you see it, but you may not believe what you saw. It is a touch of mystery in a world dominated by technology. And when the curtain falls, you may not be certain whether you were under the spell of an enchanting illusion or have witnessed an extraordinary reality. As a speaker and workshop presenter, Karges switches his focus from entertainment to empowerment in a highly interactive experience that awakens you to the possibility of reaching your full potential. Participants learn memory techniques; their intuition is tested and they are taught proven techniques of how to tap into their unconscious minds to enhance their creativity, intuition and decision making processes. Nothing is impossible in the uncanny world of Craig Karges. No smoke; no mirrors—just today's mysteries that may well become tomorrow's certainties. So get ready to not only Ignite Your Intuition but also to "Experience the Extraordinary" with Craig Karges. To experience Craig Karges live on stage, you can find his tour itinerary at www.pollstar.com. To learn more about Craig, visit his website at www.craigkarges.com.